A friend of mine gave me a whole bunch of beautiful faceted gemstones. She told me that she has had them for over 25 years and never knew what to do with them! She never had them appraised either and had no intention of keeping them. She once received them from a neighbor. 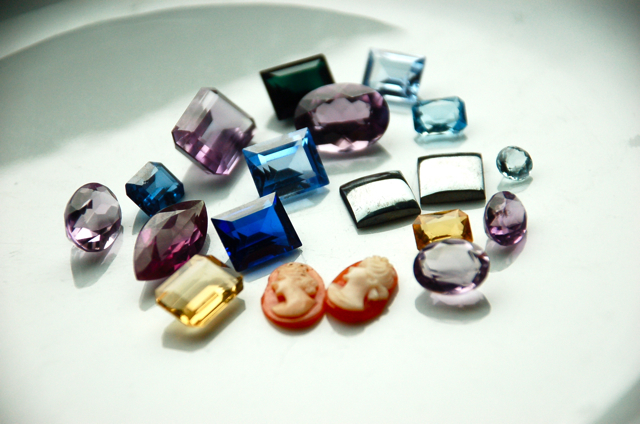 I just had them appraised and also to find out what kinds of gemstones all of them are. My oh my...what beauties. Today I started using them. I had so much fun making settings. They are quite a bit more time consuming and intricate to make, but well worth the effort. I am hoping to have some to show tomorrow. Right now I am going to head to the shop to purchase some chocolate. I am making an almond cake with a ganache topping. Just finished watching the "Top pastry chef" season and am all inspired to bake. Sometimes I think it would be fantastic to own a little pastry shop, but then I remember the hours I used to have to start work and I quickly change my mind. I don't bake very often, and if I do it is mostly bread or bread related products. John will be taking the almond cake to work tonight. They seem to be all cakeholics where he works and really appreciate someone making some goodies. So, it really gives me chance to use my other passion which is pastry.